Phishing attacks over Facebook and other social media channels are not uncommon. In fact, it is very likely that people fall for such attacks when it comes from an innocent looking link or post that is shared by somebody on their friend’s list. Facebook, with millions of users from all around the world, has become a fairly popular breeding ground for malicious phishing attacks, but there are several precautions and safety measures that can be easily undertaken. What if my account has been compromised and is sending out spam to my friends? In this case you need to inform Facebook about this immediately so that they can block/reset your account. In order to do this, visit this link – My Account is Compromised. What if my friend’s account appears to be compromised and is sending out spam? Report the spam on Facebook. Advise your friend to visit the Facebook Help Center to resolve this. Go through details of your login history to see if someone other than you has accessed your account. View your Activity Log for any suspicious or unwanted posts or actions. Go through the list of installed apps or games to see if there is something you did not give permission to. Go through your recent likes and posts to review them thoroughly. Run a free PC malware scan that is powered by Quick Heal. Keep in mind that fake pages and scammers often trick people with offers, sensational news items or other click-bait content to lure people in. As a result you should always be aware about strange typo-filled messages, mismatched links, messages that ask for your private information and messages that claim your account will get disabled unless you click on a provided link. These are all common tricks to convince people to click on potentially harmful links that lead to realistic looking phishing pages that steal private information. 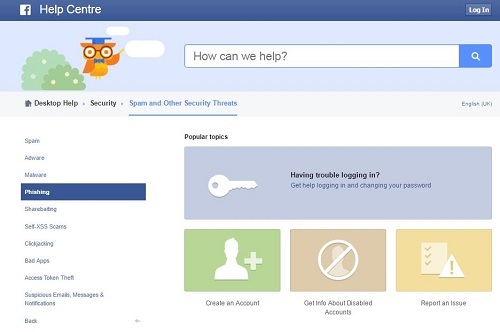 Additionally, you can also learn how to secure your Facebook account here. Hi Navin, Thanks for writing in. Our support engineers would gladly help you with this issue. Please visit http://bit.ly/QHChat to chat with us online. You can also raise a ticket at http://bit.ly/Askus and we will get back to you at the earliest. Please ensure strict vigilance of potential hacking by unwanted people to my facebook Id. Hi Eshan, Thanks for writing in. Our support engineers would gladly help you with this issue. Please visit http://bit.ly/QHChat to chat with us online. You can also raise a ticket at http://bit.ly/Askus and we will get back to you at the earliest.